In 1884, Lorenzen proposed the formula MgAI2SiO6 for his new mineral kornerupine from Fiskenæsset and did not suspect it to contain boron. Lacroix and de Gramont (1919) reported boron in Fiskenæsset kornerupine, while Herd (1973) found none. New analyses (ion microprobe mass analyser and spectrophotometric) of kornerupine in three specimens from the type locality, including the specimens analysed by Lorenzen and Herd, indicate the presence of boron in all three, in amounts ranging from 0.50 to 1.44 wt.% B203, e.g. (Li0.04 Na0.01 Ca0.01) (Mg3.49 Mn0.01 Fe0.17 Ti0.01 Al5.64)Σ9.30 (Si3.67 Al1.02 B0.31)Σ5 O21 (OH0.99 F0.01) for Lorenzen's specimen. Textures and chemical compositions suggest that kornerupine crystallized in equilibrium in the following assemblages, all with anorthite (An 92-95) and phlogopite (XFe = atomic Fe/(Fe + Mg) = 0.028-0.035): (1) kornerupine (0.045)-gedrite (0.067); (2) kornerupine (0.038-0.050)-sapphirine (0.032-0.035); and (3) kornerupine (0.050)-hornblende. Fluorine contents of kornerupine range from 0.01 to 0.06%, of phlogopite, from 0.09 to 0.10%. In the first assemblage, sapphirine (0.040) and corundum are enclosed in radiating bundles of kornerupine; additionally sapphirine, corundum, and/or gedrite occur with chlorite and pinite (cordierite?) as breakdown products of kornerupine. Kornerupine may have formed by reactions such as: gedrite + sapphirine + corundum + B203 (in solution) + H20 = kornerupine + anorthite + Na-phlogopite under conditions of the granulite facies. Boron for kornerupine formation was most likely remobilized by hydrous fluids from metasedimentary rocks occurring along the upper contact of the Fiskenæsset gabbro-anorthosite complex with amphibolite. 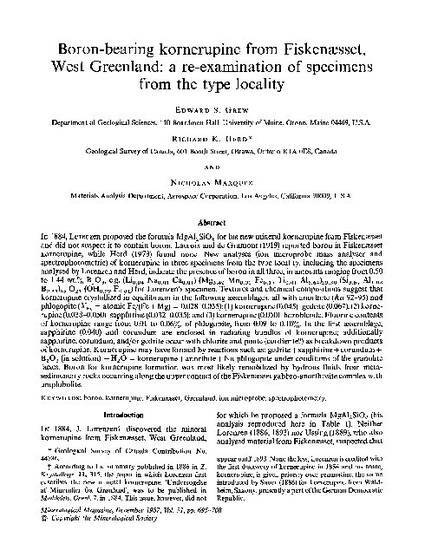 Grew, ES, Herd, RK, and Marquez, N, 1987, Boron-Bearing Kornerupine from Fiskenaesset, West Greenland: A Reexamination of Specimens from the Type Locality: Mineralogical Magazine, v. 51, p. 695-708.